Uriel Correa. 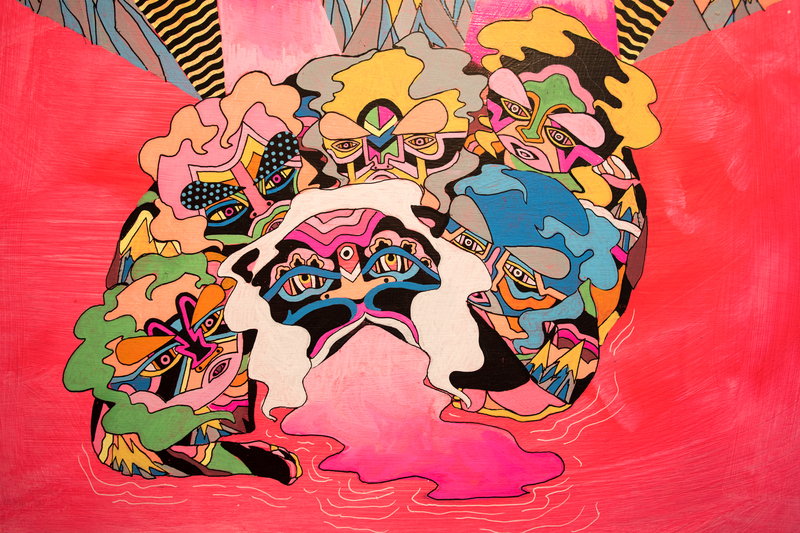 “Story of the Sacred Watchers,” 2015. Chicago Urban Art Society. 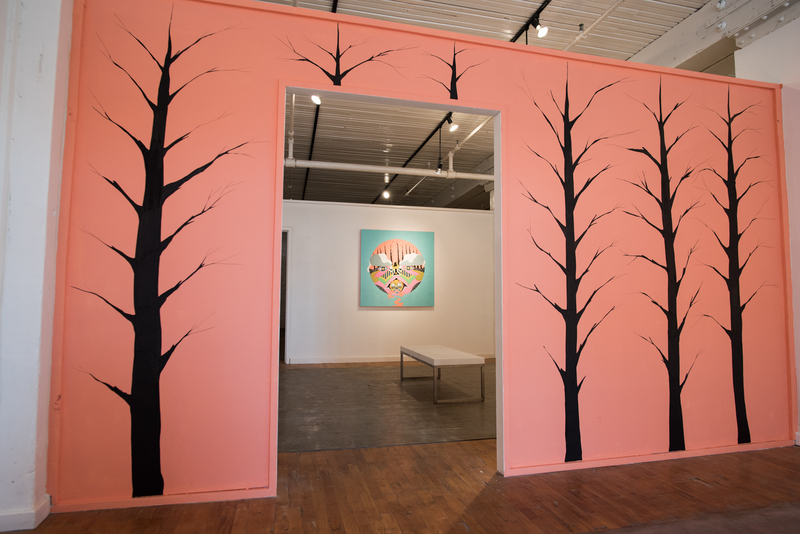 Tucked into the cozy center of the Chicago Urban Art Society’s clean and cavernous new space in McKinley Park, Uriel Correa’s two-room installation of poppy neon paintings vibrate like radioactive renditions of relics of ancient Asian and South American cultures. With a joyous palette reminiscent of traditional Peruvian Quechua clothing and graphic motifs inspired by Tibetan tapestries and retro book covers, the work dazzles enough that it does not necessitate context or explanation to be enjoyed. Highly decorative, the paintings undulate with vibrant geometric patterns that incorporate grids, stripes and spots. Stylized, wavy forms intersect with hard lines and crisp beams of color in a deeply satisfying dance of wiggly wisps and whimsical figures. Uriel Correa. Installation view, “Story of the Sacred Watchers,” 2015. Chicago Urban Art Society. The traditional, folk and pop-art aesthetic blends nicely with the infinitely large concepts behind the work. The rich narrative is largely inspired by the popular television series “Cosmos,” created by astronomer and author Carl Sagan, as well as Tibetan mythology. The show circles around sixteen “watchers”—planets that are portrayed as mask-like portraits on square panels and hung on the wall in a grid. In relation to the rest of the cosmos, the environment and organisms on planets move so quickly that the planets themselves seem like sentient beings, according to Correa. The watchers witness life unfolding in all parts of the universe. Several paintings include cats, too, which represent the challenges that anthropomorphic beings place on the planets. Through September 19 at Chicago Urban Art Society, 3636 South Iron.